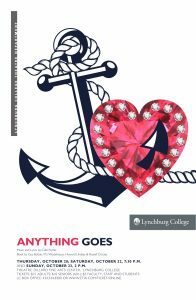 “Anything Goes” is a musical version of the age-old tale of Boy-Meets-Girl and the complications which ensue – all wrapped around one of Cole Porter’s magical scores. The action takes place on the New York sailing of the Ocean Greyhound AMERICA bound for England. Musical numbers include “It’s De-Lovely,” “Friendship,” “I Get A Kick Out Of You,” “All Through The Night,” “Anything Goes,” “You’re The Top” and “Blow, Gabriel, Blow.” Come spend a “De-Lovely” evening on the cruise ship America. It’s a wonder that all the romances are sorted out and disaster is averted aboard the magical ship where anything goes!